My team teases me because they claim that I declare each and every gift design my "absolute favorite". Okay, so maybe I'm guilty of this but let's face it, there's something special about getting THAT excited about each project that goes out our studio door. Which is why it was nearly impossible to select just ten gift designs for this year's "Top 10" list. We took into consideration, not only our own favorites, but also evaluated our blog posts and social media accounts to see what you all were loving as well! 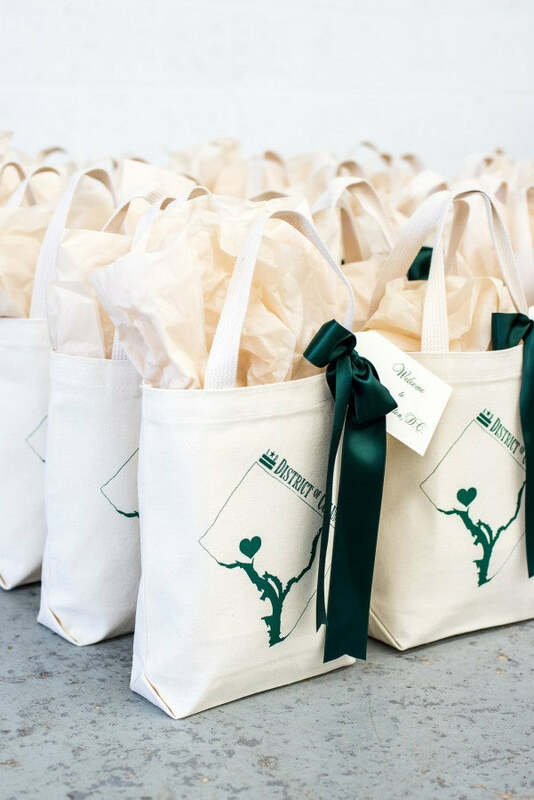 Planned and designed by Rhiannon Bosse Celebrations, S & A's vision for the wedding welcome gifts involved treating their Sea Island, Georgia guests to gifts unlike anything they'd ever seen before. The plan was to present the guests with their gifts upon arriving at the welcome dinner that kicked off the wedding weekend and from what we hear, the guests were blown away. 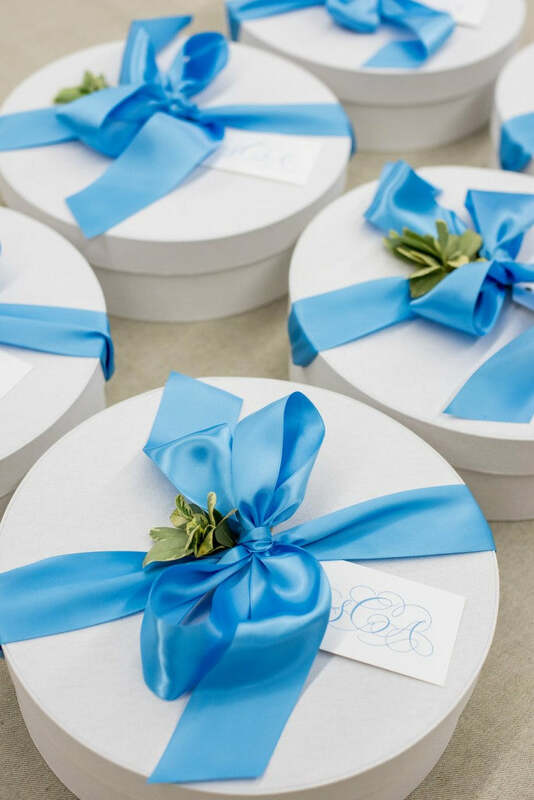 We created a southern aesthetic using french blue on large round hat boxes along with plenty of monogramming by MMInk Studio throughout the gift for a cohesive look. 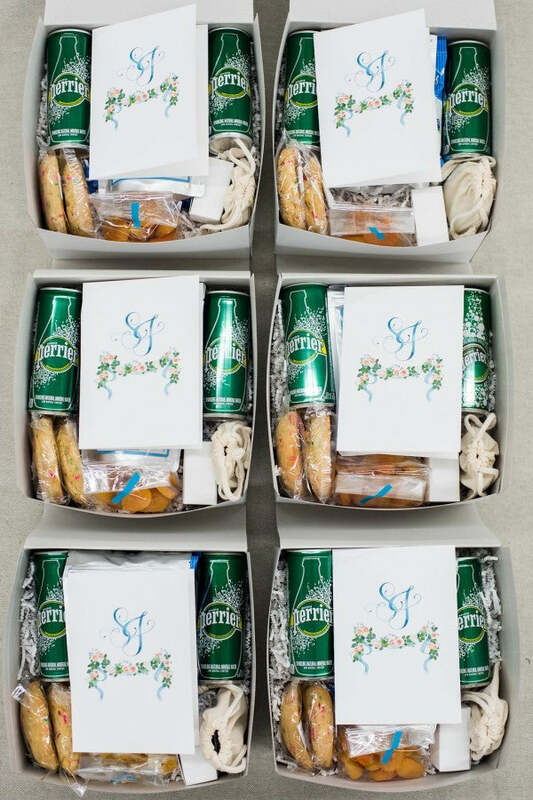 Contents included tote bags featuring an artistic map of Sea Island, cashews, custom monogrammed cookies by Sugar Studio, monogrammed packages of biscotti by Buttercream Bakeshop, monogrammed packages of kettle corn popcorn, Savannah Bee honey, honey dippers, and two large bottles of water! As you can tell, the keyword here was "monogram" and we loved every bit of bringing this vision to life. When NBA star Harrison Barnes and his then-fianceé Brittany were planning their Newport, Rhode Island wedding with the design and planning expertise of Couture Parties, they knew they wanted very special wedding welcome gifts to wow their guests. 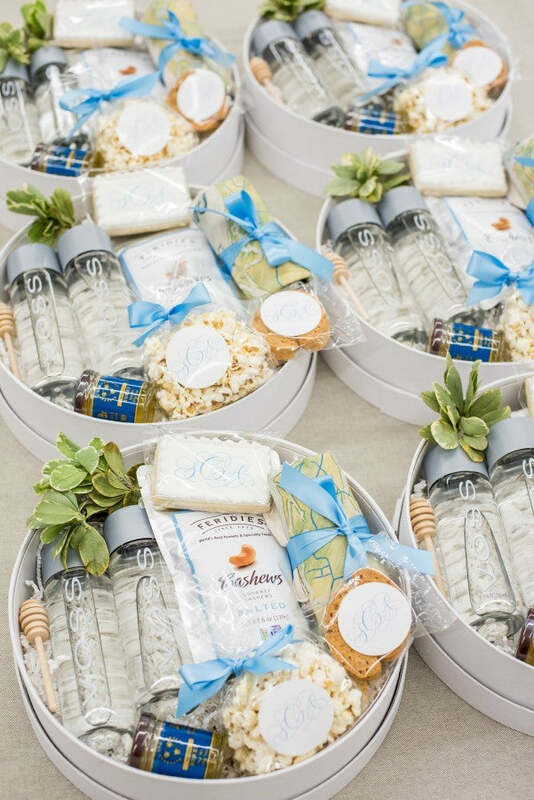 We selected several seaside-inspired items such as salt water taffy, local kettle corn popcorn, and last but not least, adorable sailboat cookies by Sugar Studio. However, what really set these gifts apart was the custom illustration work we commissioned Alli K Design to do for the welcome letters designed by Just Write Studios. Not only did the welcome booklets feature the normal itinerary and transportation information, but also a series of illustrations portraying "where they met", "where she said yes" and "where they'll say I Do". 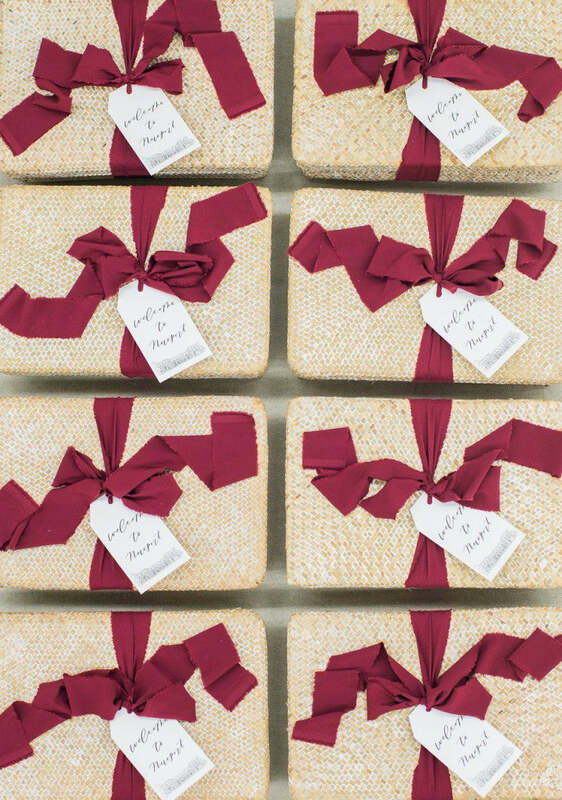 We used beautifully-textured baskets with luxe burgundy ribbon to perfectly mirror the organic feel of the event. We finished them off with gift tags featuring an illustration of wedding venue, Rose Cliff Mansion. 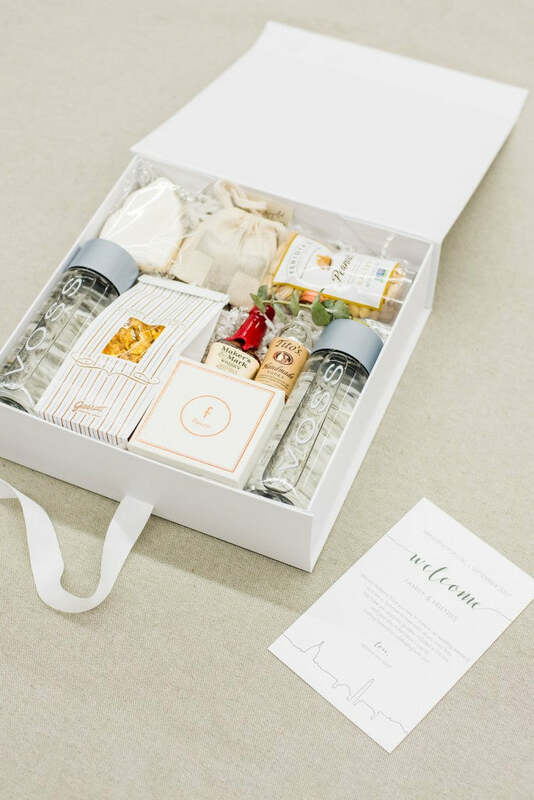 These wedding welcome gifts are proof that relatively simple gifts can be dressed up with thoughtful, intentional details and brought to a whole new level. 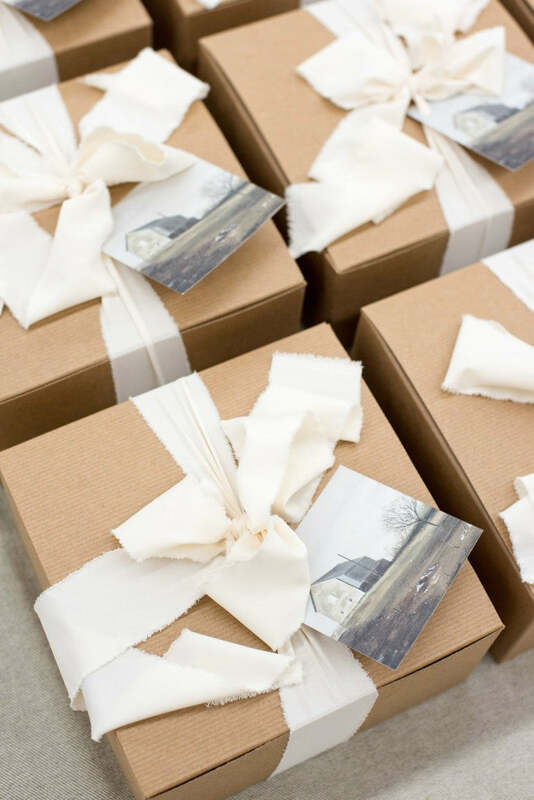 We used kraft tuck-top boxes for the packaging, an economical choice, but then incorporated artwork done by the mother-of-the-bride into the gift tags plus flowy ivory ribbon to take things up a notch. 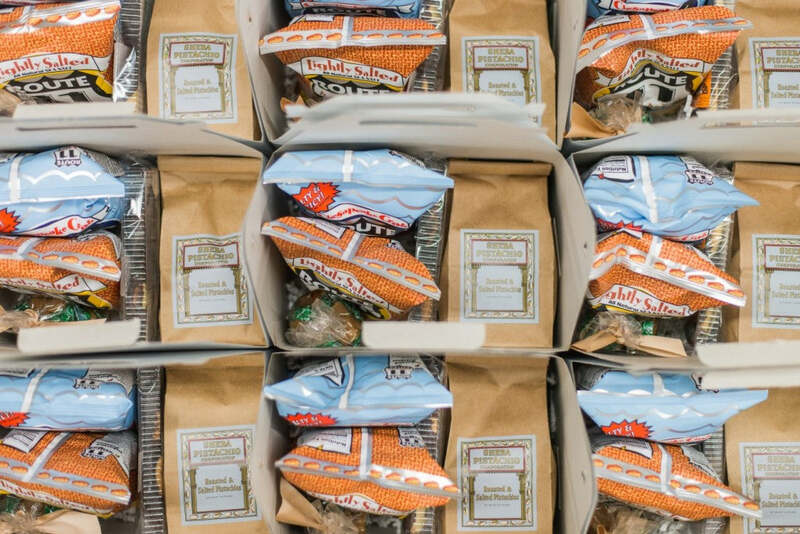 The contents inside these farm-inspired gift boxes were Maryland-inspired (think Bergers cookies and crab chips!) and enjoyed by all out of town guests at this late-fall Carte Blanche Events celebration. Fresh sprigs of rosemary added the perfect seasonal touch! Classic, neutral, modern, chic. 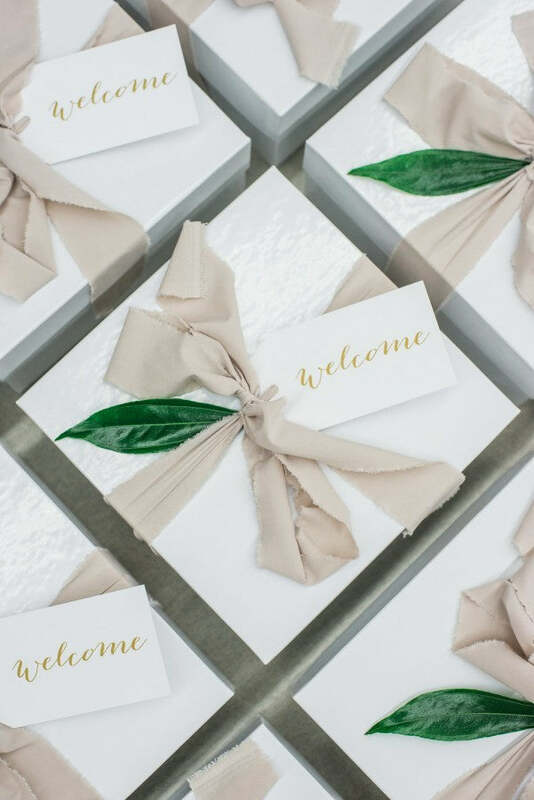 All of these words describe the look we recreated in these monogrammed wedding welcome gift boxes for a lovely Soco Events couple. Perhaps you remember us telling you about them here earlier this year? 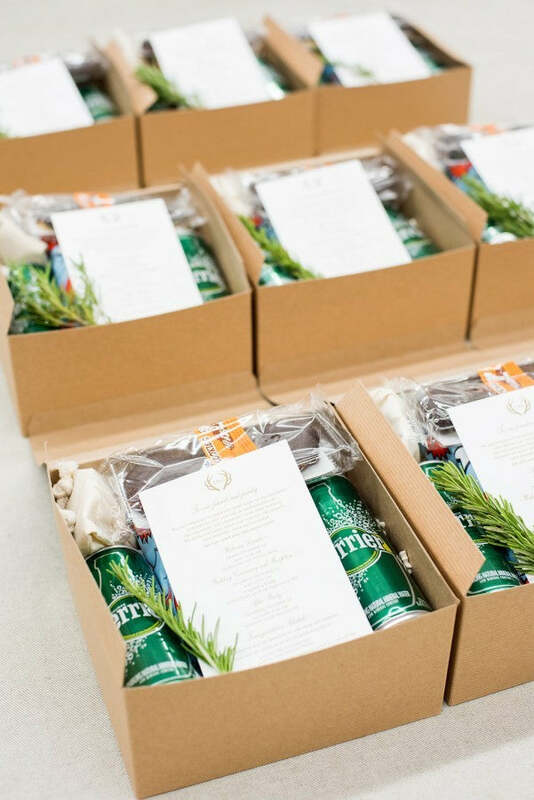 We used deluxe white gift boxes, custom welcome letters with itinerary information and a DC city map, along with DC-inspired treats. Oh, and we can't forget the Garrett's popcorn, a nod to the groom's Chicago roots! 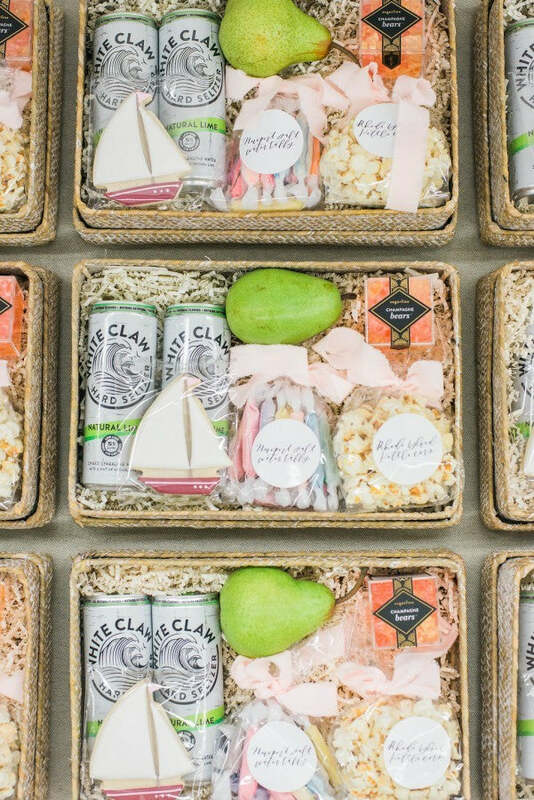 These next gift boxes were created for two ultra-fun grooms with tons of style. 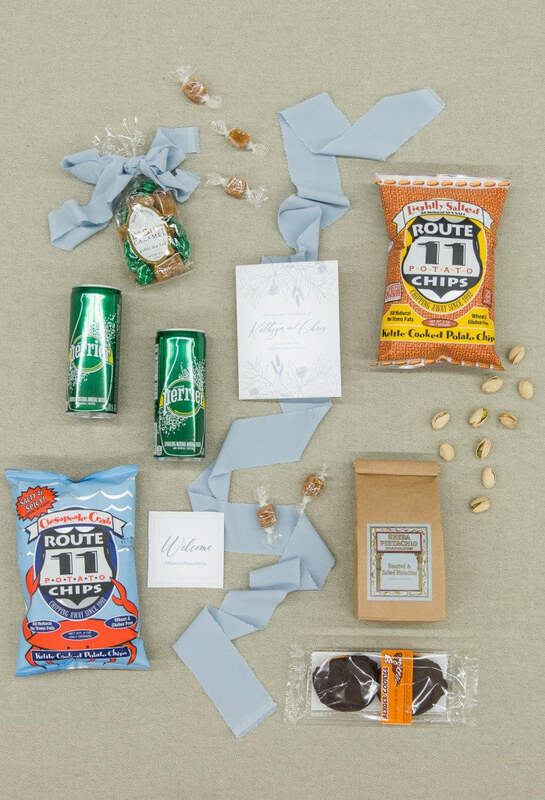 They let us have full creative freedom with these modern masculine gifts so we first started with Washington, DC sourced snacks to welcome the guests to their Meridien House wedding. (Think Teds Bulletin pop tarts and D.C. monument chocolates!) 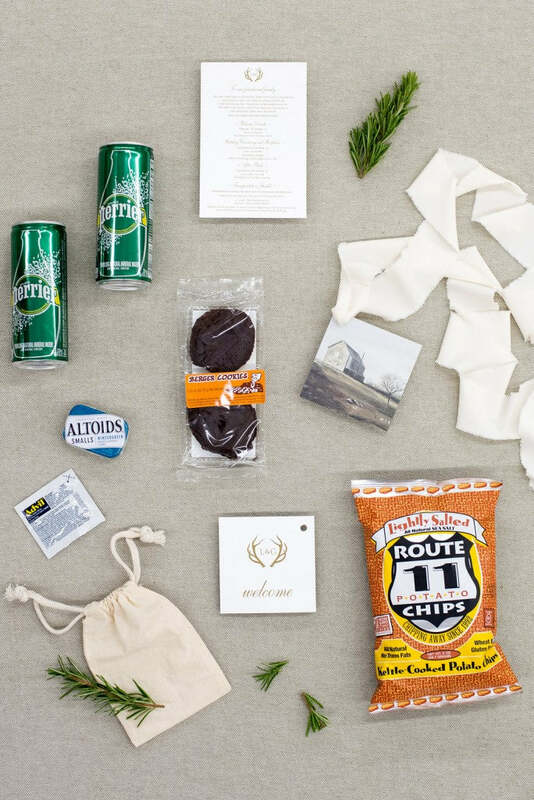 Then we also tied in snacks local to each of the grooms' home states, Iowa and Mississippi. But here's where it becomes fun. Because they're both mega Beyoncé fans (we're talking FRONT ROW at several shows!!) we of course couldn't resist including Bey in the form of a cookie by Sugar Studio. 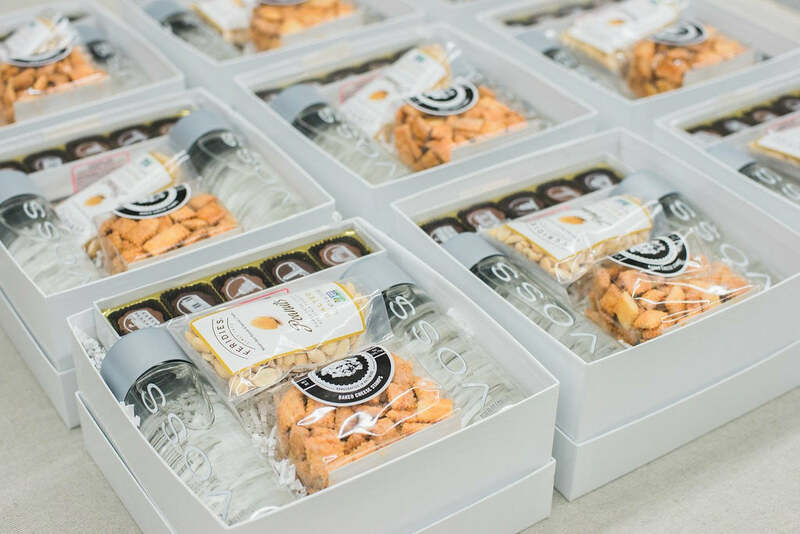 The cookies definitely got all of the guests talking immediately upon arriving to this flawlessly designed event by A. Dominick Events and from what we hear from the guys, guests are STILL talking about these welcome boxes months later. 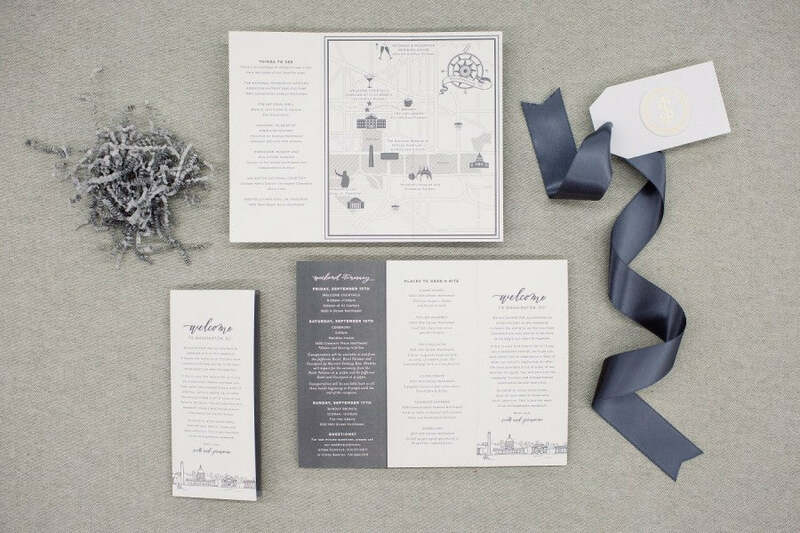 Grey and white accordion-style welcome booklets were designed by Cheree Berry Paper along with the couple's monogram. With the monogram being a circle, we turned into gold foil medallions and affixed them to white gift tags for a three dimensional effect. 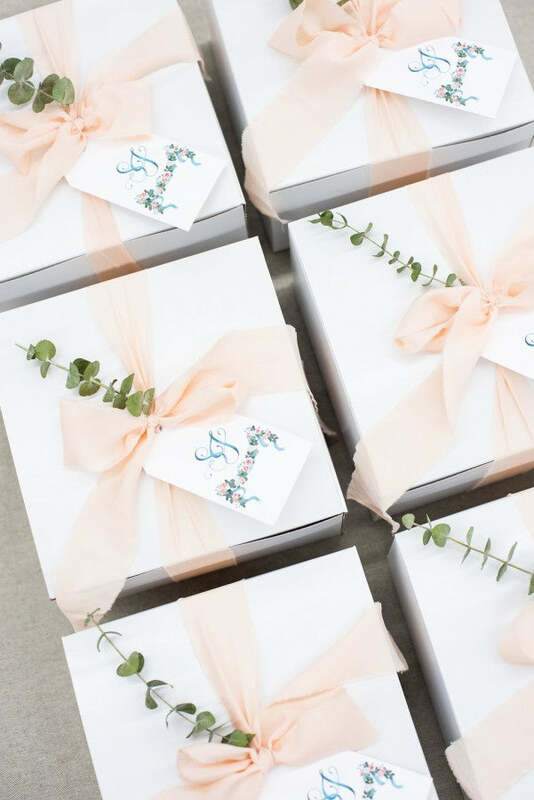 These blue, white and peachy blush gifts were another example of using basic white flip top boxes and filling them to the absolute brim with goodies for the guests. 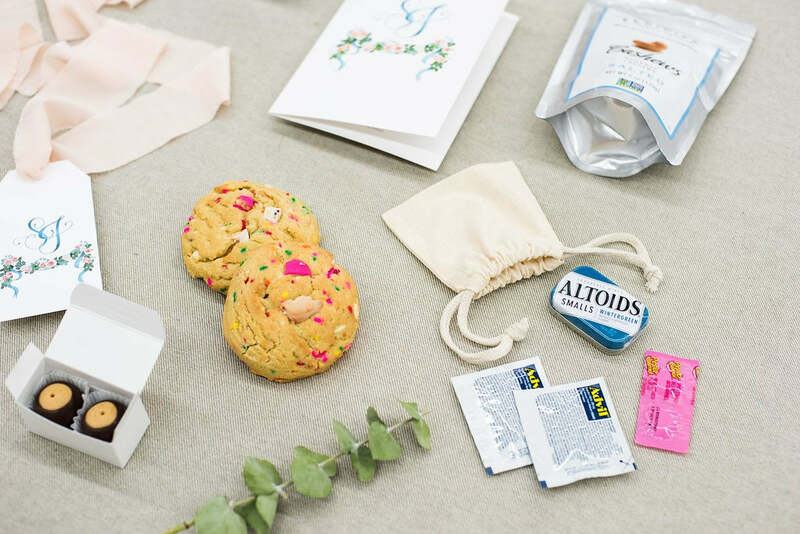 Cashews, dried apricots, pretzel crisps, locally-baked confetti cookies and even a custom amenity kit. But can we talk about the gift tags and welcome letters? 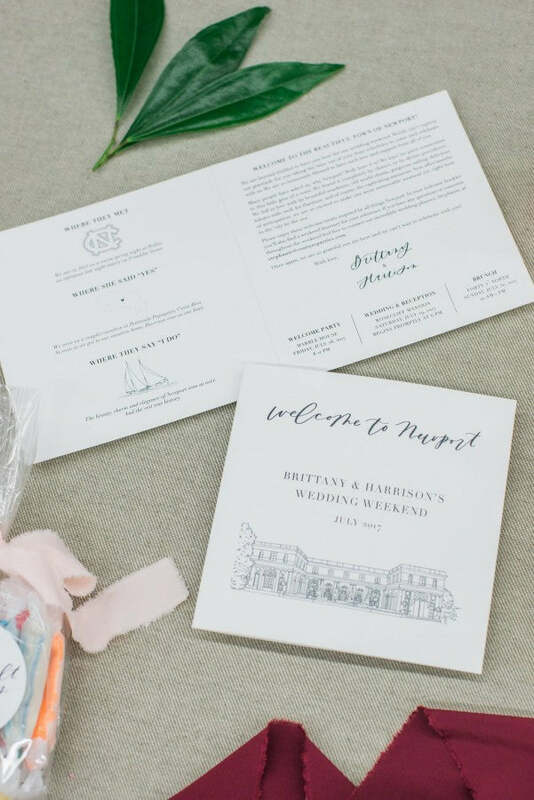 The couple's watercolor monogram by Lemontree Calligraphy was carried all the way through to the welcome gifts and definitely set the stage for this beautifully-designed Ohio wedding, planned by MMJ Events. These dusty blue and white gable boxes for an Easton Events Pippin Hill couple were the epitome of tasteful, southern hospitality. 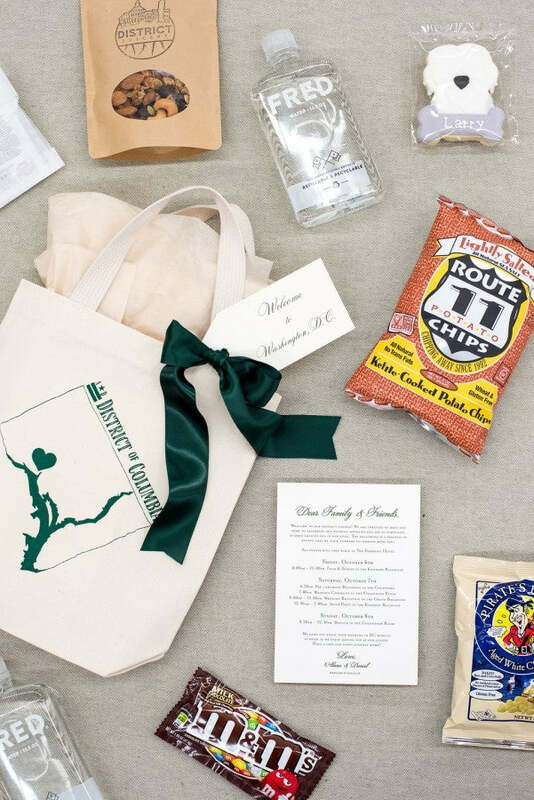 We included elements of both Maryland and Virginia but also a bag of pistachio nuts from the company owned by the bride's grandfather. He even had special custom packaging designed just for the pistachios so they treat bags would reflect the color palette of the wedding. What a guy, right?! For an additional meaningful touch, we added Bequet caramels from Jackson Hole, a favorite spot of the couple's. 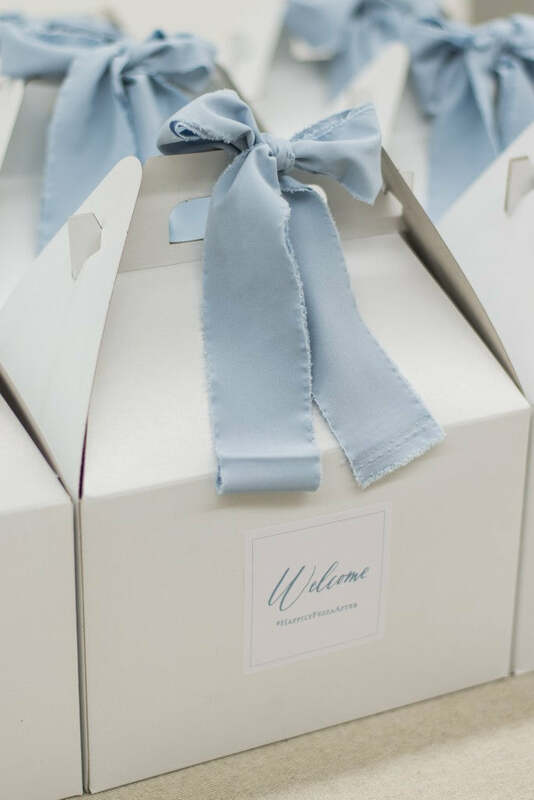 We finished the gift boxes off with flowy dusty blue ribbon by Torn & Tied which tied in perfectly with the accordian-style welcome booklets designed by Jess McSweeney. 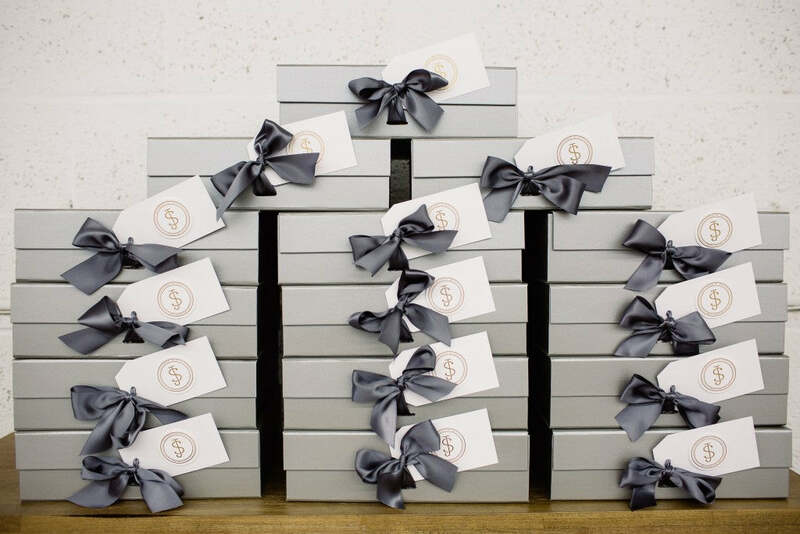 These particular curated gift boxes were a challenge in the best way! We knew we wanted a breakfast-in-bed concept but also had to keep everything in blacks, whites and metallics to mirror the modern design created by Grit & Grace for the couple's Mellon Auditorium wedding. 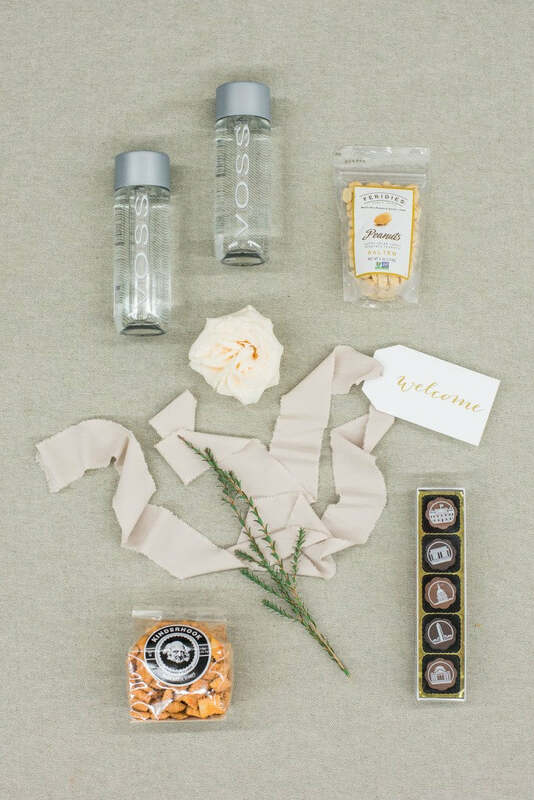 For personal touches, we included tupelo honey as a nod to the bride's Tupelo Mississippi roots. With the groom's family hailing from Ireland, Irish breakfast tea was a must! 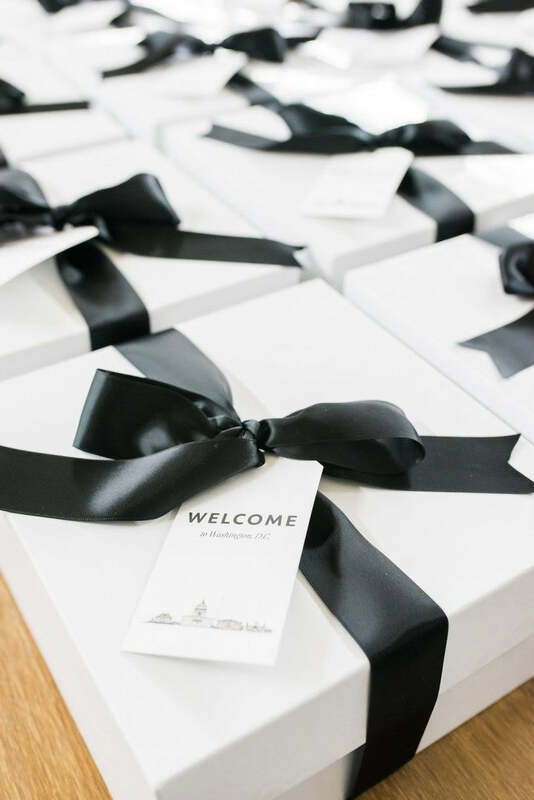 Black and white modern welcome letters and matching gift tags were created by DC-based Paperzest and were the perfect finishing touch. 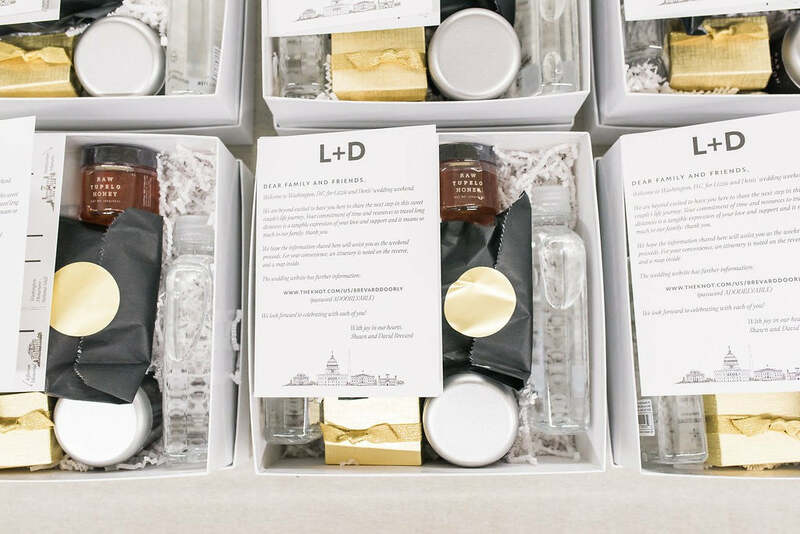 We are rounding out our lineup with these simple, neutral, and classically beautiful DC-inspired wedding welcome gifts for a sweet Engaging Affairs couple. The goal for these gifts was to incorporate elements of DC, Maryland AND Virginia into the gifts and we did so with Virginia peanuts, Kinderhook Snacks from Baltimore and DC monument chocolates from Chouquette. The other goal was to keep the gifts neutral and without a lot bright colors to act as an extension of the muted color palette of the event. 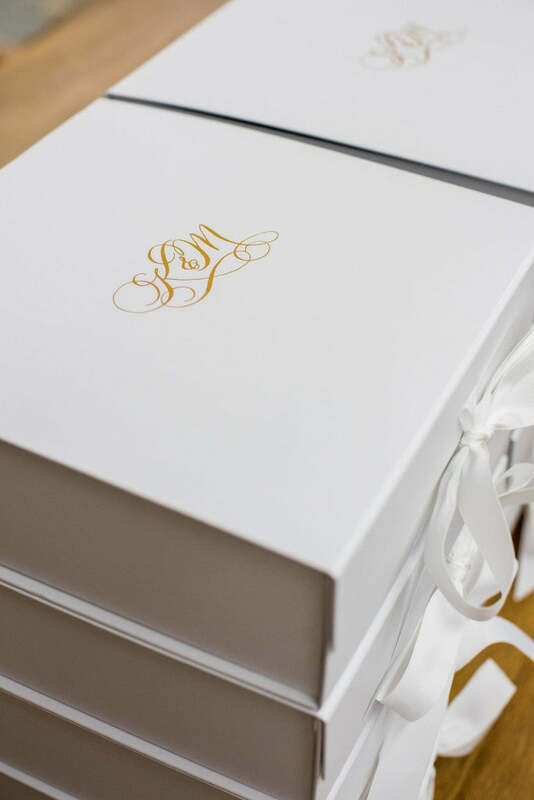 We selected deluxe white gift boxes, taupe ribbon, and white gift tags with gold ink. Even the gift contents themselves were neutral in color. It's no secret that we love working with neutrals and so this project was an absolute joy.